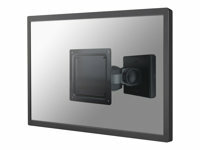 The NewStar LCD/TFT wall mount, model FPMA-W200, allows you to mount a flatscreen to the wall. The mount has 3 movements offer maximum flexibility. This model allows users to swing, tilt and turn the flatscreen for maximum efficiency and comfort. Depth: 14 cm. It easily connects to the back of each flatscreen due to the VESA hole pattern. This wall mount holds screens up to 10 kg with a VESA 75x75 or 100x100 mm hole pattern. Ideal to mount screens up to 24" to the wall. This wall mount includes white and black covers to adjust the mount to the colour you like.